From January 23 through January 25 is the 7th Annual celebration of Fruitcakes In the Alley (FITA), held in the northern Orlando community of Altamonte Springs. FITA is a weekend long, charity bowling/music event, which benefits Juvenile Arthritis research and treatment. In fact, this event, which is organized and run by my PHriends in the Parrot Heads of Central Florida, has raised over $147,000 for Juvenile Arthritis since its inception. Attendees will have the pleasure of singing along with bands and solo artists like the Trop Rock Junkies, Ronnie Tsunami and the Wave Riders, Bill Cockrell, deciBel, the Conch Fritters, Captain Josh, Jim Morris and the Big Bamboo Band, Nowhere to Rum, Jimi Pappas and, of course, yours truly! We plan to exceed last year’s total contribution of $35,210. Then, from February 28 through March 1 is the 4th annual celebration of Music on the Bay, held at Whiskey Joe’s Barefoot Beach Bar in Tampa. This wonderfully philanthropic event has been crowned the Trop Rock Music Association “Event of The Year” for both 2013 and 2014. Last year, Music on the Bay attendees partied with a purpose and through their generous support and gifts from their hearts raised $31,000 for Shriners Hospitals for Children! The list of artists performing is impressive and long, and includes Sunny Jim, Charlie Imes, John Frinzi, Jerry Diaz and Hannah’s Reef, Highway 1, Trop Rock Junkies, Jimmy Stowe and the Stowaways, The Boat Drunks, Jim Asbell and the Tropiholics, Latitude, Renn Loren, the Sauce Boss, Young Rebel Goombas, Jimmy and the Parrots, Ramajay Intercoastal, Captain Josh and Banjody, Michael J. Weiss, Jack Mosely Band, Jim Morris and the Big Bamboo Band, and of course, me again! We’d all love to see you there! It certainly is an honor to be included in these amazing lists of performers and to perform for such effective charitable events, and there’s more coming… But I’ll spare you the rest of the details for now, except to say that I love being a part of the Trop Rock community and truly look forward to performing every event including PHlockings at many Parrothead Club socials, Happy Hours, Birthday Parties, and yes, even Cruises to Cozumel (more to come on that in a later blog)! Parrot Head Phriends, Schooner still has some summer dates available for house parties in Florida, southern Georgia, between Florida and eastern Pennsylvania in late July, and the Carolina Coast in early August. 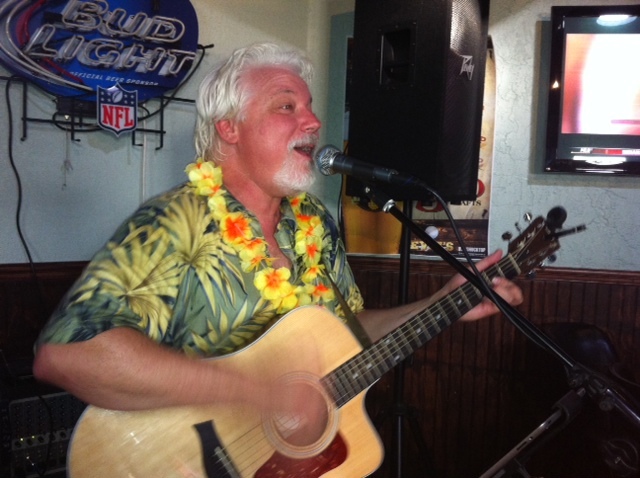 If you’re looking for a trop rocker who can sing your favorites along with clever tunes of his own that are sure to connect with your guests, such as In Arrears Drinking Beer, Pier Pressure and Mid-Life Vices, give Schooner a call for open dates. Voted Beachfront Radio’s 2012 Bad Boy of Trop Rock, Schooner has played top trop rock venues like Tropical Isle on Bourbon Street in New Orleans; the Sand Box, voted #1 house party venue by Beachfront Radio; Meeting of the Minds; and for Parrot Heads across the country! Just returned from the first leg of my Just Add Bourbon summer trop rock tour. Playing at Pompano Joe’s in Destin is a memorable one — perhaps the most beautiful view from the stage that I’ve ever seen, and plenty of Parrot Heads in the crowd! 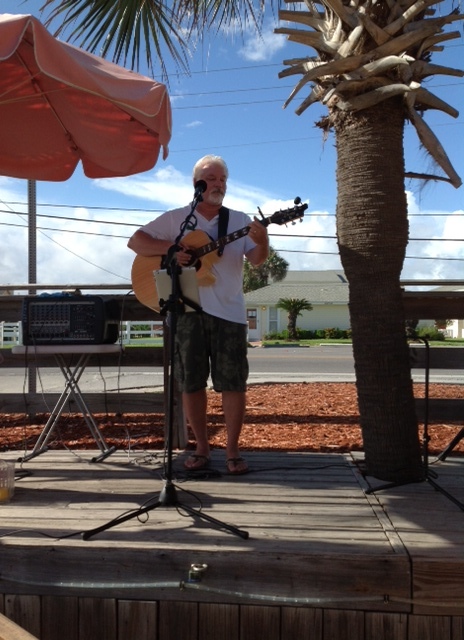 Schooner played Pompano Joe’s in Destin to kick off his Just Add Bourbon summer tour. Usually that turquoise water that the Gulf of Mexico is famous for is my backdrop, but this time I got to look out over the white beach and aqua water as I played. I then moved on to Tropical Isle in New Orleans on Bourbon Street. What a cool place! While the neon green Hand Grenades — New Orleans’ most powerful drink — were quite tempting, partaking in such a beverage and still being able to remember the words to my songs would not have been possible. Not doubt, a potential “Fool Button” episode. So I abstained…this time. A big thanks to Pam and Earl for having me! I was particularly impressed with Pam’s Hand Grenade-green Porsche , custom designed and painted to match the drink. 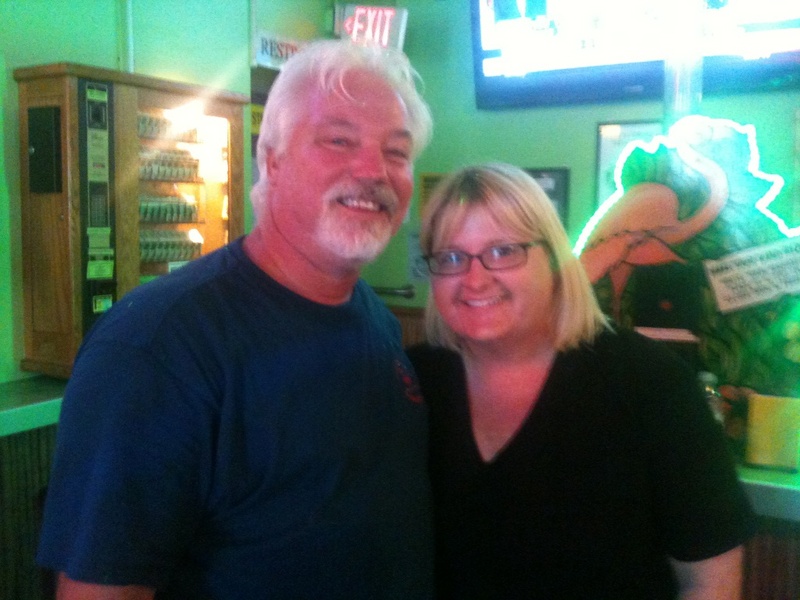 Schooner with Julie Nevius, manager of Tropical Isle on Bourbon Street, New Orleans. Make sure to stop by next time you’re in the Big Easy, and vote for Tropical Isle for Best Trop Rock Venue in the Beachfront Radio awards this year! A special thanks to Derby City Dave, who stopped by with family and friends while in town for the Zydeco Music Festival. It was great seeing a good friend and Parrot Head extraordinaire from home. For more summer dates on the Just Add Bourbon tour, check my tour dates page. Hey Parrot Heads, Schooner’s “Just Add Bourbon” tour is expanding! Check out our tour dates page for an updated list of trop rock concerts including new bookings in York, Pennsylvania. And if you live in the Destin, Florida or New Orleans area, make sure you stop by Schooner’s gigs in those areas the first week of June. Schooner is also booking private Parrot Head house parties throughout Florida for the summer. Any open date is an option. Take a look at the tour dates and let us know if you’d like to book one of his openings. Fins up! I like to vary my online listening habits, from Beachfront Radio and Radio Margaritaville to some of my other favorite trop rock stations. I’ve also been listening to Pandora a lot lately, but they clearly don’t understand trop rock. Type in “Jimmy Buffett,” and you’ll get a few relevant options — certainly some Buffett (around every 10th song or so), mixed in with a small amount of Zack Brown Band and Bob Marley. Every once in a while they’ll throw in some Harry Belafonte, but that’s about where the trop rock ends. Somebody at Pandora must have decided that Jimmy Buffett is easy listening (what?! ), because most of what comes out of my speakers is James Taylor, the softer side of The Eagles and Jack Johnson. Don’t get me wrong — I’m a huge fan of all of these artists. However, they are by no stretch of the imagination considered trop rock. While I get that the true trop rock artists who haven’t hit the mainstream are probably limited from Pandora due to contracts and contacts, they might want to take another look at their algorithms. Because there are plenty of songs out there that I would consider trop rock, even if the artist isn’t a full-time trop rocker. Come on, people! Schooner adds new dates in St. Armands, Osprey and Destin! Check out Schooner’s Tour Dates, because we’ve added several new ones! We continue to announce new dates for Schooner’s Just Add Bourbon Tour — June 4 at Pompano Joe’s in Destin (one of Schooner’s favorites!) Why bourbon, you might ask? Well, aside from the fact that it’s delicious, Schooner is heading to Bourbon Street in New Orleans to play June 7 at Tropical Isle, voted #5 Trop Rock Venue by Beachfront Radio listeners. We’ll make a stop in Destin along the way. 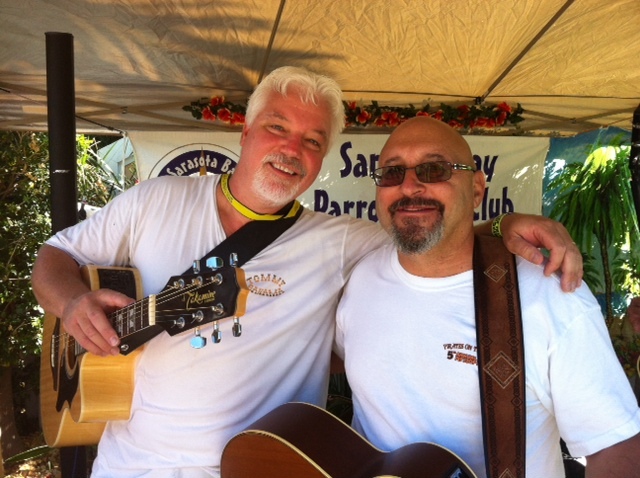 Beach Bum it with Schooner on June 4 at Pompano Joe’s in Destin. New dates also include several spring dates for Spanish Pointe in Osprey — Tiki Bar Extraordinaire — and ChaCha Coconuts in St. Armands Circle next Tuesday night. Come out for the most excellent fish tacos in Sarasota that we’ve tried so far! If you’re along the route from Sarasota to the Big Easy — Tampa, Gainesville, Tallahassee, Pensacola, Mobile, Pascagoula, Gulfport, Whatever — Schooner is also booking house parties. So contact him if you’re interested in booking a Trop Rock house party. I was just spending a few minutes updating the information I have on my “links” tab and was reminded that there are so many people who travel in Trop Rock circles who do so much, simply for the love of what they’re doing and for others. This may come off as a”Duh” kind of moment. Because many of you are Parrot Heads, you are already aware of the selflessness of others in the Phlock, but there are a few non-Parrot Heads that are fans of my site. That in mind, I wish to give a shout out to some of those hard working, giving Pholks who dedicate so much time for the benefit of song writers and trop rock in particular. There are several good peeps out there who run the internet radio stations that we, as trop rockers, count on to be heard. Of course, a huge thanks goes out to DJ Jeff at Beachfront Radio, who, along with Captain Cali and Cheeto Gyrl continue to promote Trop Rock everywhere. They’ve won the award for Top Trop Rock Station several years in a row and are well deserving! 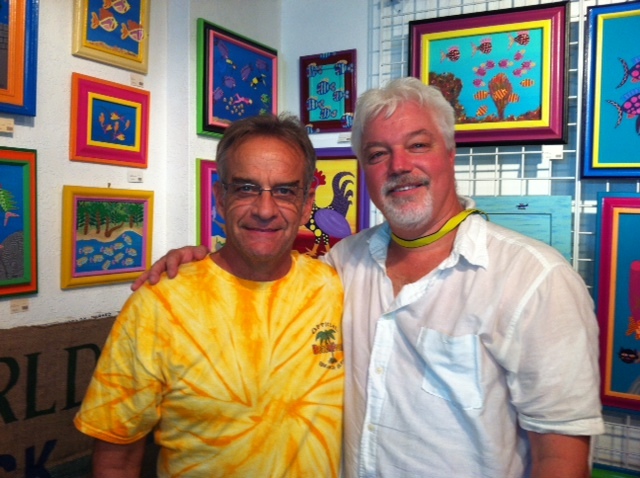 Thanks to Koz of Koz’s Green World Gallery in Key West — a great supporter of Trop Rock! There are several others out there, who not only play Schooner tunes (and other trop rockers), but also do what they do for little or no reward. Please check them out! Bret Walton is the CEO and Music Director at Island Radio, a great destination for tunes that take you to your favorite destinations! 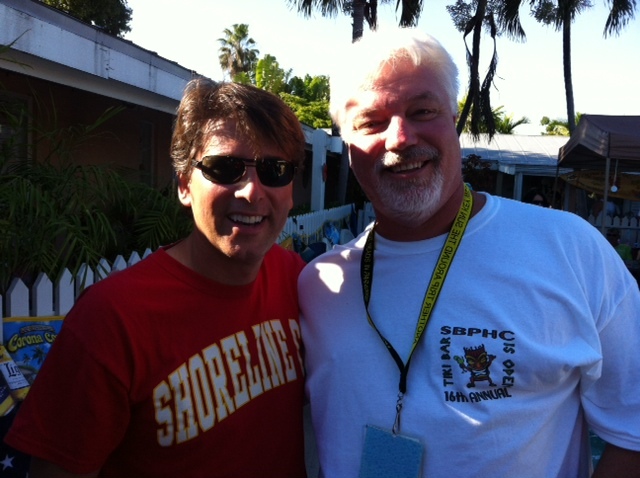 At The Shore, Contact Don “Da Pyrate” Winfield to request an artist on this terrific trop rock station! At Island Time Radio, DK the DJ serves ’em up every Monday night! Check him out! 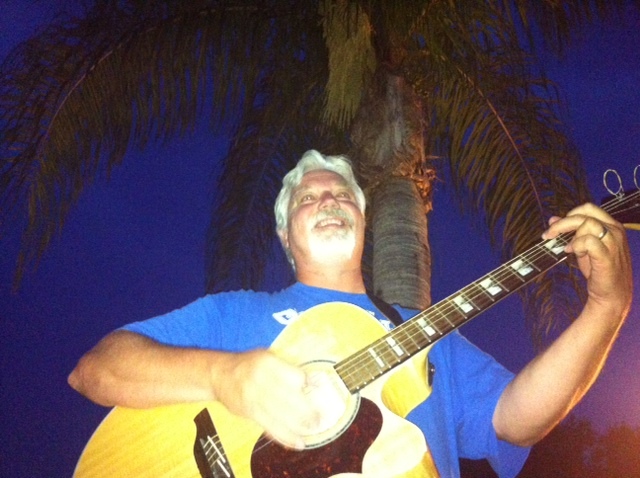 Sam Densler oversees Song Writers Island, a wonderful haven of original Trop Rock tunes. In addition to these great stations, there are so many others who have always supported original and Trop Rock music. There’s one that I wish to mention now, though I know there are so many. If you haven’t met Koz from Koz’s Green World Gallery in Key West, you’d better get up and go! Koz is an amazing artist, A HUGE supporter of Trop Rock, and one hell of a nice guy! I suppose this is me saying thanks to these and other great supporters of Trop Rock. It’s also my reminder to you, to do the same. Face it, our lives just wouldn’t be the same if we didn’t have them to help us lose ourselves in our own little Margaritaville! Mark your calendars! Schooner is playing June 7 at Tropical Isle on New Orleans’ Bourbon Street, which was just voted the #5 Top of the Trops Trop Rock Venue by listeners of Beachfront Radio. This will be the midpoint of his Gulf Coast tour, so Parrot Heads, we hope to see you there! How is it possible that it’s already December? We’re already four days into the 25 Days of Christmas, and it’s going to be a busy month. 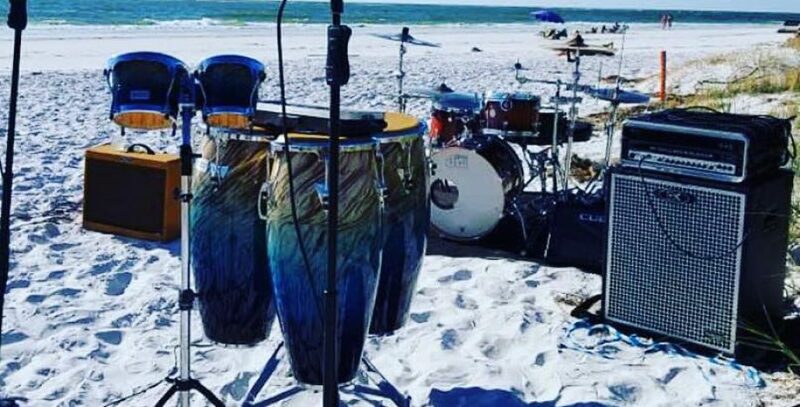 Schooner has several big gigs coming up this month, ranging from Christmas parties to a Parrot Head End of the World Party on the 21st to a New Year’s Eve party on Siesta Key, but he’s still got some open dates. So if you’re looking to book a little last minute fa-la-la, let us know. In the meantime, have a Merry Christmas, Happy Hanukkah, Cool Kwanzaa, and may you have a fabulous Festivus for the Rest of Us! 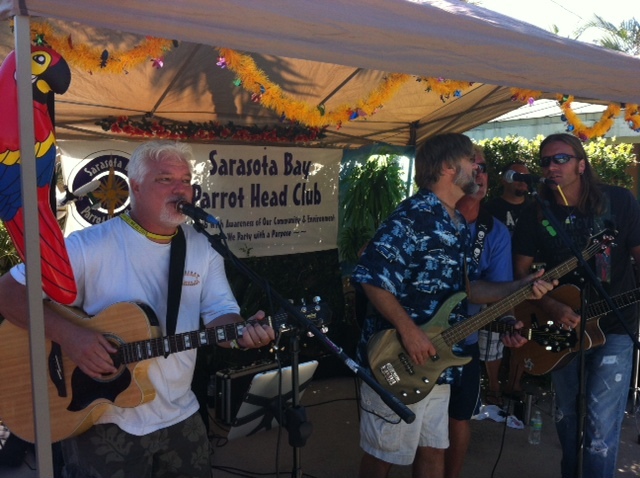 Had a blast playing with Chris Sacks and the guys for the Sarasota Bay Parrot Heads! Saturday was perhaps the best day of all. 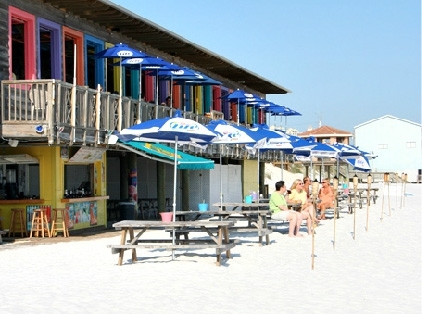 After relaxing on the beach at the gorgeous Casa Marina, I played for the Sarasota Bay Parrot Heads (my home club!) at the Ocean Breeze Inn. They had shots of jello, shots of concoctions that tasted like apple pie, shots Rum Jumbie…an awesome day, to say the least! I joined some trop rock favorites on stage. Chris Sacks and his band were a blast to play with, and were definitely some guys I could hang with. They played the same kind of music I like — rockin’ trop rock. Mike Mangum sat in, cool guy; and Gary Philips joined on guitar, also a great guy; plus Duane Harlick from the Tropoholics — awesome voice, best version of Bob Seger’s “Night Moves” that I’ve heard. Lastly, John Frinzi took the stage — a charismatic guy with a great voice who apparently the girls really love! Had a blast playing and watching. Good times. Enjoyed playing with Gary Philips at Meeting of the Minds. Great guy! Took my family to the Southernmost Hotel Cafe for a late-afternoon lunch. My 8-year-old son and I were very pleased to know that the beach there, which the restaurant overlooks, has a bikini top-optional beach. The second pair of boobies my guy has seen so far (the first was on the jumbotron at the Cincinnati Buffett show). He seems pretty pleased with that. Wish my wife had let me take a picture to share. Had a late night at the Lazy Gecko to play again with Chris Sacks and the boys, and hang out with John Friday and Danni Hoy (love her new CD! ), then back home to Sarasota. Thank God I didn’t have to fly back up north to where it’s snowing. I don’t miss those days one bit. If my worst case scenario is Siesta Key, I’m doing pretty good in life! The ladies in the Sarasota Bay Parrot Head Club loved John Frinzi.